Even going at a leisurely pace, you can stroll across the City of London in an hour or so. How can that be? Everyone knows that London is a vast metropolitan area that stretches for miles across southern England. The answer is that the City of London is only a small part of this vast metropolitan area, a city within a city, that is only 1.12 square miles (hence its nickname “The Square Mile”). The importance of The City, as it is often called, is disproportionate to its size. It is the center of the U.K.'s financial industry and is one of the leading global financial centers. Numerous banks, insurance companies and other businesses are headquartered or have offices. Although only about 7,000 people live in the City, about 300,000 work there. It is the oldest section of London, founded by the Romans in 47 A.D. However, unlike the “old towns” of many European capitals, The City is not made up of quaint buildings that time has passed by. Although the street plan dates back to the Middle Ages, the buildings range from very old to very new. It is an area that has moved with the times. In this walk across the City, we shall look at some of its sights and landmarks. We shall not see everything there is to see in the City. Rather, the objective is to give you an idea of what can be seen and of the atmosphere of the City. 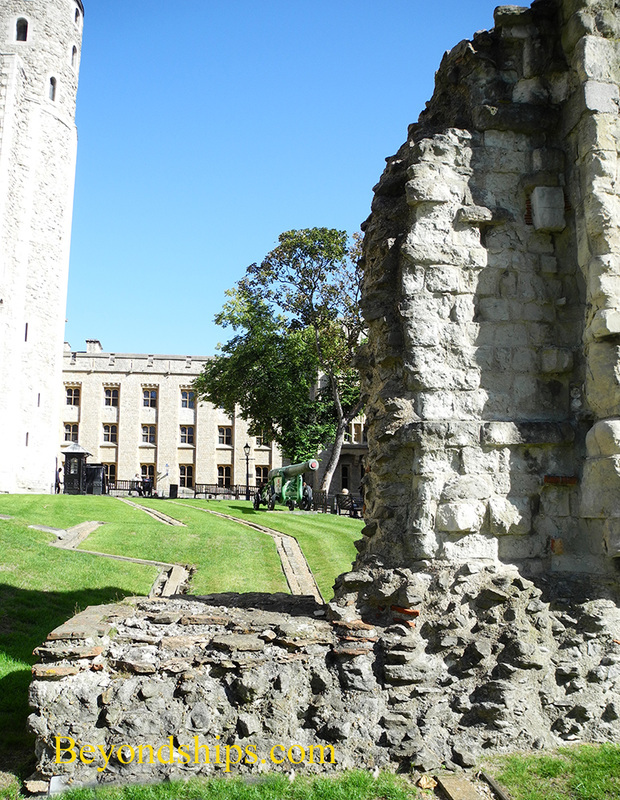 Above: Remains of the Roman Wall that surrounded ancient London can be seen in the grounds of the Tower of London. Above right: One of the Inns of Court in the Temple. Approaching the City from the west where most of London's hotels are located, we first enter the realm of judges and lawyers. Two of London's four Inn's of Court are within the geographic limits of the City. The inns are where the barristers (lawyers who specialize in litigation) have their chambers (offices). More than just office space, the inns have their own ancient codes and rituals. 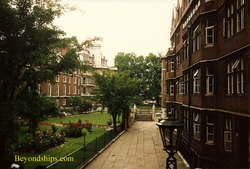 Indeed, even though the Middle Temple and the Inner Temple are physically located within the City, they are not subject to the City's governing body, the City of London Corporation. Rather, they are independent enclaves. The City of London Corporation does, however, own the Old Bailey, the Central Criminal Court of England and Wales. This is where major criminal cases are tried. 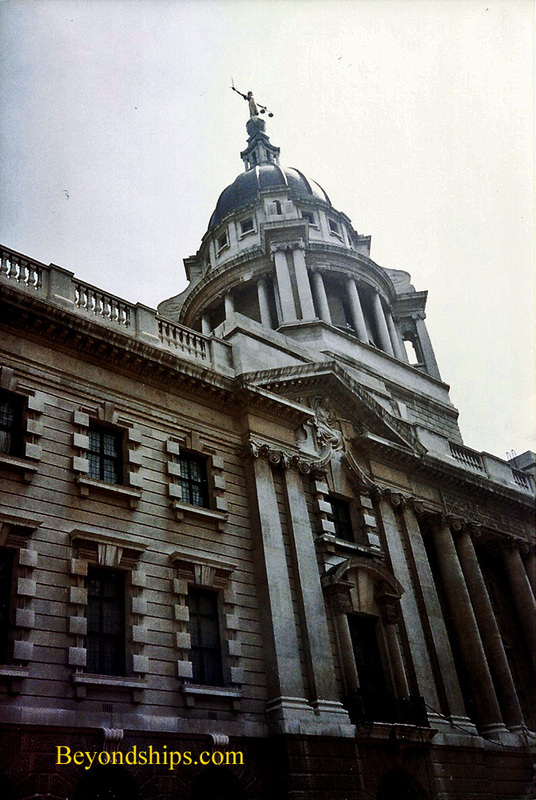 You have undoubtedly seen dramatizations of Old Bailey trials in movies such as “Witness for the Prosecution” and television series such as "Rumpole of the Bailey." The trials are open to the public but visitors are subject to strict security procedures. The present building dates from 1902. Its best known feature is the figure of justice standing at the top of the dome. 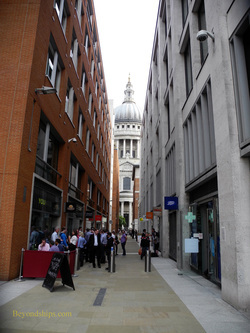 Walking in a southeasterly direction from the Old Bailey, you soon come to the City's most famous landmark, St. Paul's Cathedral. Prior to 1666, there was a great medieval cathedral on this site. But in September of that year, a fire broke out in a bakery not far from here on Pudding Lane. Before the Great Fire of London was extinguished, it had destroyed almost all of the City. King Charles II commissioned Sir Christopher Wren to build a replacement for the cathedral as well as replacements for 51 of the 102 other churches destroyed in the fire. 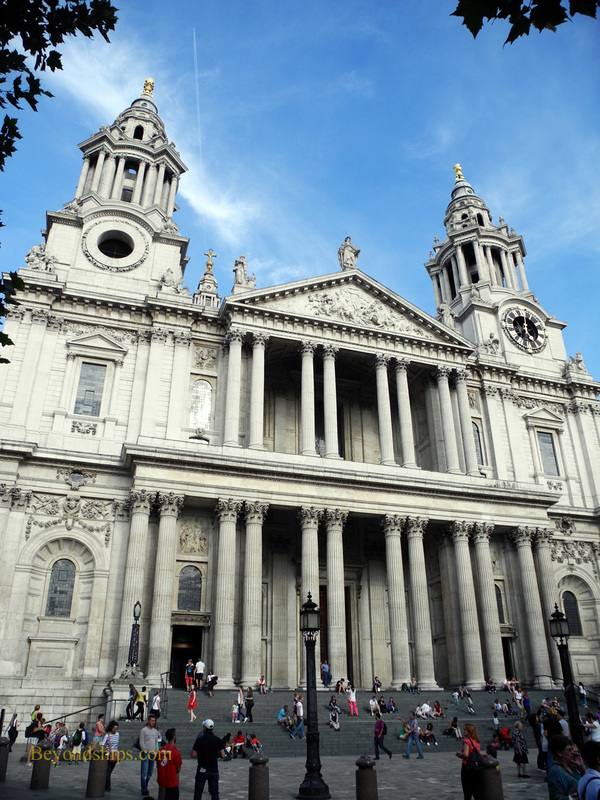 While the smaller churches, many of which survive to this day, are considered architectural gems, St. Paul's is Wren's masterpiece. Done if the baroque style it is ornate but not overpoweringly so. Its proportions are delightful and inside the space soars. 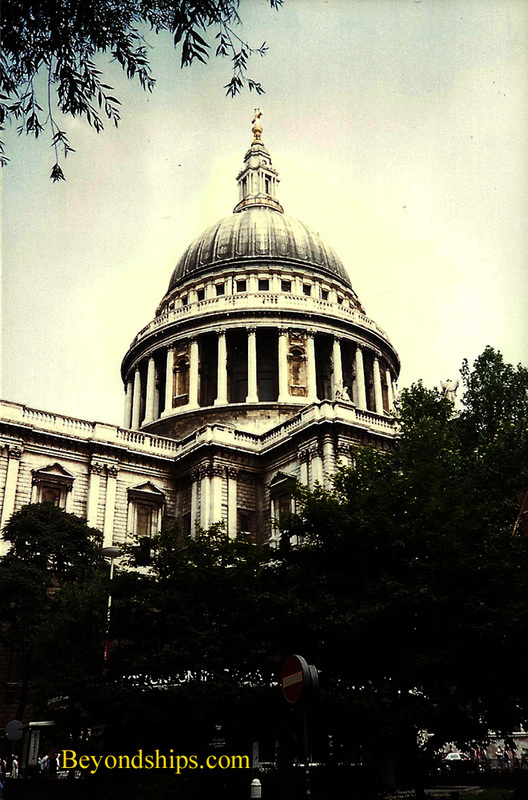 St. Paul's survived the Second Great Fire of London in December 1940. During the Blitz, German aircraft dropped incendiary bombs on the City. As in 1666, there was great destruction. However, St. Paul's was not damaged. Photos of the landmark dome surrounded by fire became a symbol of British defiance of the Nazis. 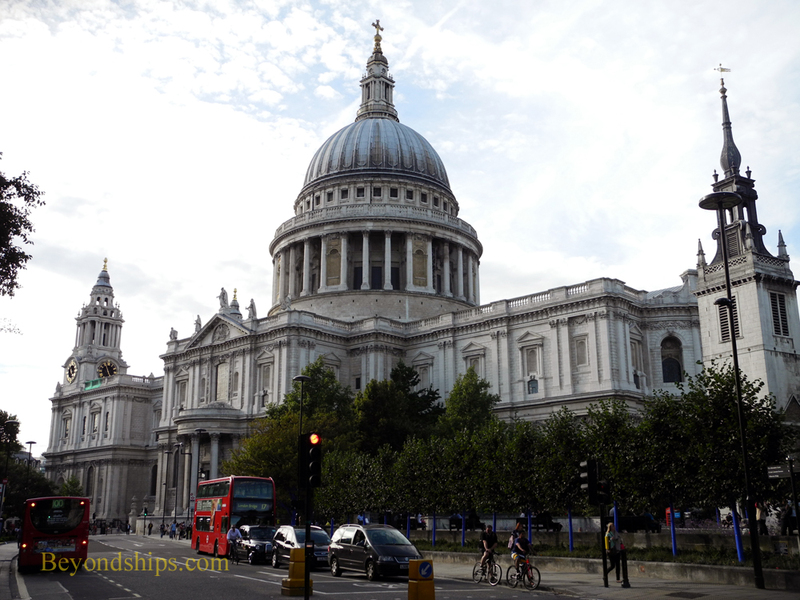 The cathedral is where the great British naval hero Admiral Horatio Lord Nelson is buried. It is also where Prince Charles married Princess Diana. Above: The cathedral from the south. Below: The front of the cathedral.